Hames Sharley Feature | Aussie MUD! Further to my last article, my research has proven we’re not such laggards after all, compared to overseas mixed-use developments (MUD). In this article, I’m covering some recently completed projects, some award-winners and some going through the approval process. All show that this building typology can produce some well-designed outcomes. I’ll start in Sydney, with the recently opened East Village by Payce. 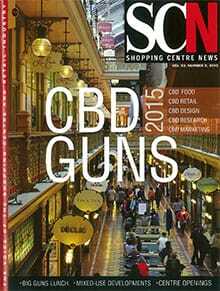 It’s a mixed commercial, retail and residential development in Victoria Park, some 3km south of the Sydney CBD. It contains 206 apartments with a sky park, an urban marketplace, restaurants and a commercial office component, which includes Audi Australia’s corporate head office. The retail is anchored by Coles at one end and a large fruit and veg, and deli operator to the south, in a traditional dumbbell mall configuration. It’s serviced by a large carpark underneath, accessible by travelator. The interior décor is plywood fin ceilings laid over blackened-out services, with a bluestone-paved floor, creating the marketplace feel. Wrapped around the exterior on the major street frontages are a variety of restaurants and cafés, catering to the ever-growing populus of this new suburb. 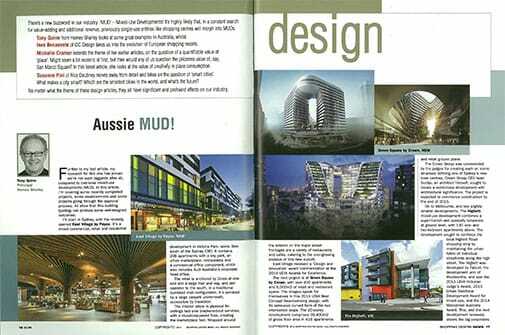 East Village received a ‘Design and Innovation’ award commendation at the 2014 UDIA Awards for Excellence. The next project is at Green Square by Crown, with over 400 apartments and 5,000 square metres of retail and restaurant space. The images speak for themselves in this 2014 UDIA Best Concept Award-winning design, with its sensuous curved form of the two intertwined loops. The 20-storey development comprises 39,400 square metres of gross floor area in 416 apartments and retail ground plane. The Crown Group was commended by the judges for creating such an iconic structure defining one of Sydney’s new town centres. Crown Group CEO, Iwan Sunito, architect himself, sought to create a world-class development with architectural significance. The project is expected to commence construction by the end of 2015. On to Melbourne, and two slightly smaller developments. The Highett mixed-use development combines a supermarket and specialty tenancies at ground level, with 130 one- and two-bedroom apartments above. The development sought to reinforce the local Highett Road shopping strip by maintaining the urban fabric of individual shopfronts along the high street. The Highett was developed by Fabcot, the development arm of Woolworths and won the 2013 UDIA Victorian Judge’s Award, 2013 Urban Taskforce Development Award for mixed use, and the 2014 Mainstreet Australia Award. This, and the next development reviewed, shows the big corporates can produce good urban outcomes that add to the community fabric. The Coles Brighton mixed-use development comprises a supermarket and Liquorland outlet, with 95 residential apartments above named 380 Degrees because of the commanding views to the bay, city and ranges beyond. The $110-million development comprises one-, two- and three-bedroom apartments over five levels, with three levels of basement parking serving the retail and residential. The development was a joint venture between Abacus Property Group and Coles. The building’s upper façade features coloured perforated metal sliding panels, to allow balconies to become wintergardens and to enhance privacy. These upper levels are composed of smaller components, more domestic in scale, whereas the retail base has large glazed openings, clearly expressing the building program. It is a successful realisation of the emerging trend for mixed-use development in a local high street. Now on to Brisbane, to the Gasworks site at Newstead. Developers FXP and Mirvac are major players in the quest to turn 17 ha of prime riverfront land into a vibrant new community. Stage One, Energex’s Headquarters, is completed and home to 1,700 workers and ground-floor shops. Stage Two is a retail and commercial development, incorporating the historic gasometer frame on Skyring Terrace. The old frame has been used to define a new public space, in which markets and performances are carried out at regular intervals. It acts as a centrepiece to the development, to which the enclosed retail street and commercial buildings connect. The retail component is anchored by a Woolworths supermarket, deli, food and beverage outlets, cafes and service/lifestyle retail which also features some stunning industrial inspired public artwork. Adjoining commercial buildings house Energex, Areo and Bank of Queensland among others. On completion, Gasworks will include seven buildings featuring 17,000 square metres of retail, 103,500 square metres of commercial and some 750 residential apartments. Not far afield is a proposed $600 million development named FV by Gurner, in Fortitude Valley. The first stage of the three-tower development, which houses 900 apartments in total, has had strong pre-sales. The project also includes a luxury 90-room, 4.5-star hotel and 3,000 square metre resort-style private club, which features a pool with a sunken bar, three VIP lounges and a barbeque sundeck area and outdoor cinema. A ground-floor retail and restaurant precinct, with combined total of 3,200 square metres fronts Brunswick, Alfred Street and Barry Parade. FV will become the western gateway to the Valley, and will provide a key role in the rejuvenation of the precinct. Moving west to Perth, in the CBD is one40William, located directly above a Peth underground railway station with an unusual site context, in that it includes historic building fabric, major street frontages and a pedestrian mall. This integrated mixed-use comprises 36,000 square metres of commercial, with 6,000 square metres of retail and F&B tenancies. The design celebrates heritage, and promotes connectivity between workplace, retail and public transport creating a shared civic space. The project won Australian Institute of Architects and Planning Institute Awards in 2011, and the Chicago Athenaeum International Architecture Award in 2012. Next it’s on to Subiaco, where Subiaco Square, a mixed-use development of retail, residential, commercial, civic and transport interchange was successfully developed, winning UDIA awards. The project is an excellent example of transit-oriented development, and features a Woolworths supermarket, specialty shops, restaurants and cafes topped with residential and commercial, while beneath is Subiaco train station. The scale is two- and three-storey, reflecting its suburban context with gabled roofs and a palette of rendered walls, face brick and stone cladding. All these examples show that we in Australia can, and are, producing good quality design with this mixed building typology.